When Victoria Arlen was eleven years old, she contracted two rare diseases simultaneously and fell into a mysterious vegetative state. For two years her mind was dark, but in the third year, her mind broke free, and she was able to think clearly and to hear and feel everything—but no one knew. When she was fifteen years old, against all odds and medical predictions, she was finally able to communicate through eye blinks, and she gradually regained her ability to speak and eat and move her upper body, but she faced the devastating reality of paralysis from the waist down because of damage to her spine. However, Victoria didn’t lose her strength or steadfast determination, and two years later, she won a gold medal for swimming at the London 2012 Paralympics. 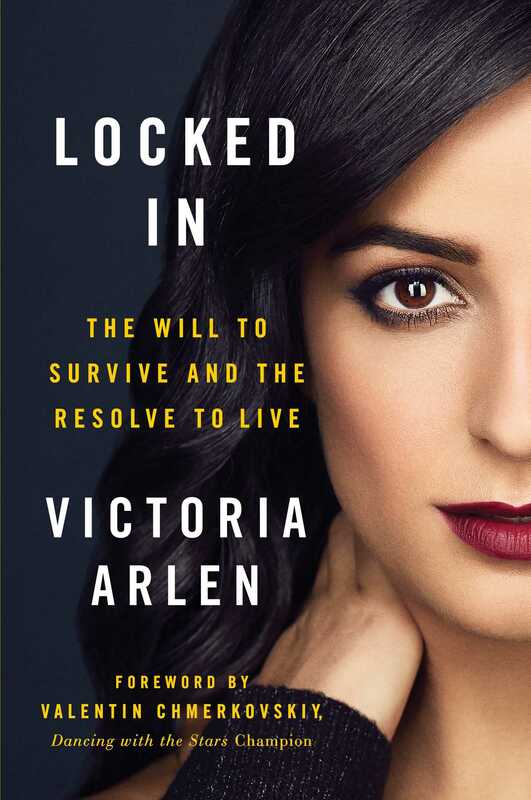 In Locked In, Victoria shares her never-before-published story—the pain, the struggle, the fight to live and thrive, and most importantly, the faith that carried her through. Her journey was not easy, but by believing in God’s healing power and forgiveness, she is living proof that, despite seemingly insurmountable odds and challenges, the will to survive and resolve to live can be a force stronger than our worst deterrents. Locked In 1 HOW DID I GET HERE? I hear commotion in the darkness. I gasp for air, but I feel like I’m drowning. A strong pressure crushes my chest, forcing my lungs to contract against my will. Machines urgently ping. Panicked voices shout all around me. Suddenly, bright light blinds me as I struggle to grab whatever is down my throat. I realize my arms are strapped down and can’t move. Multiple hands hold down my convulsing body, and my bed is being quickly pushed through a white-walled hallway at an alarmingly fast speed. “You are okay, Victoria,” I hear over and over again. I’m confused. All I can think is BREATHE! And then, I plunge again into total darkness. My eyes open to searing bright light, and I hear a loud, screeching noise. My body begins to shake uncontrollably, and a painful electricity surges through my body, causing it to convulse and thrash about. I see strangers running into the room, yelling. Their voices sound scared; their hands push me down. As the seizure subsides, I try to get my bearings. Why would anyone say they miss me? How long have I been out of it? I hear my mom in the background. Surely, she can tell me what’s going on. “Mom, Mom!” I shout, but she doesn’t react. Why can’t she hear me?! I quickly realize I have no control of my body, not even my eyes. I can see, but only what’s directly in front of me. When I try to sit up, I feel disconnected from my body. I can’t move or make any sound. I am literally locked inside my own body. My heart races and my head spins. I try to make sense of what’s going on. I have so many questions. I think, 2006? But I’m not certain. I’m overcome with panic. I want to scream for help. I try to calm down, but that only makes things worse. I’m lost and confused. Why won’t someone just please tell me what is going on. I can’t move a single muscle. No matter how hard I try to scream for help, nothing comes out. I want to breathe and scream and speak. I have so many questions, and I have no memory of how I got here. Claustrophobia creeps in, and my panic escalates. I have to find something—anything—to keep my brain sane and ease the panic that’s overtaking me. My body refuses to function, but my brain is somehow operating normally. Completely normally. My knowledge. It’s all here. My mind is the only reassurance and calm I have. It is the only thing I can control. And then it dawns on me that my ability to think is the most important function of all. The thought of literally losing my mind is beyond terrifying. Thankfully, I can think and understand. Sanity check . . .
My name is Victoria Arlen. I am the daughter of Larry and Jacqueline Arlen. My brothers are LJ, William, and Cameron. I enjoy swimming, dancing, and hockey. I love my fluffy dog, Jasmine. I have my mind and my memories, and as far as I know, I have my sanity. I’m still here—I remind myself of that over and over again. Nothing comes to mind. I remember an absolutely excruciating head pain, and I remember being rushed into an ambulance, and then everything goes dark. Now, I’m alive and can think. But I have no memory of how I got here or why I can’t move or talk. When I try to think back before the headaches and the seizures, all I can remember is being healthy. I’d always been healthy. In fact, I was probably the healthiest of the Arlen bunch (although we were a relatively healthy family). I’d always had a crazy amount of energy and would go and go and go until my mum made me go to bed. I craved adventure and always allowed my imagination to go for miles and miles. I loved running around with my brothers, and I played every sport my parents would allow. There were never enough hours in the day to do all I wanted to do. Even then, I’d wanted to change the world and make a difference. How could I lose all of that? How could the girl who could do everything not even be able to wiggle a finger? I keep forcing myself to think. Since I can’t work any other muscle in my body, I might as well use the one that works, my brain. I remember back to the summer before fifth grade, when I was ten. My mummy took me to the doctor with what seemed to be a bug bite in my left ear. The doctor hadn’t been concerned about it, but then I started getting ear infections, which continued throughout the entire summer. The doctors diagnosed me with swimmer’s ear, but that didn’t make sense because I had swum for years without any problems. I remember that I’d developed asthma in the fall. Then, I had several rounds of pneumonia alternating with what the doctor called the “flu.” These episodes often included fainting spells. It seemed I’d have one or two good weeks, but then I’d come down with something. I still did well in school and sports, but somehow, as my mummy would say, “it was as if the stars were misaligned.” But no one was too awfully concerned because I always bounced back and went back to my normal routine. But about a year later, on April 29, 2006, I do not bounce back . . .
Victoria Arlen’s life drastically changed in 2006 when she developed two rare conditions known as Transverse Myelitis and Acute Disseminated Encephalomyelitis. In 2010 after almost four years, she began the fight back to life, learning how to speak, eat, and move all over again. She not only recovered, but she has since become an accomplished motivational speaker, actress, model, and swimmer. She has won three Silver medals and a Gold medal for swimming from the London 2012 Paralympic Games and has broken multiple World, American, and Pan American records. In April 2015, she joined ESPN as one of the youngest on-air talents hired by the company, reporting for espnW, X Games, and Sportscenter across all platforms. She has become world famous not only for her story and accomplishments, but for her message, “Face It, Embrace It, Defy It, Conquer It.” She is the author of Locked In.